Hope you are all well and not got too much snow, it snowed here most of yesterday but didn't really stay around too long and it's much brighter today. Background - Made with sentiments from the "All My Love"
Do take a look at the challenge blog where you will find lots of information about our new sponsor and lots of great inspiration from the Design Team. This is a brilliant card Pat, love the way you've used the sentiments..very clever! Our turn for the snow today...yuck! 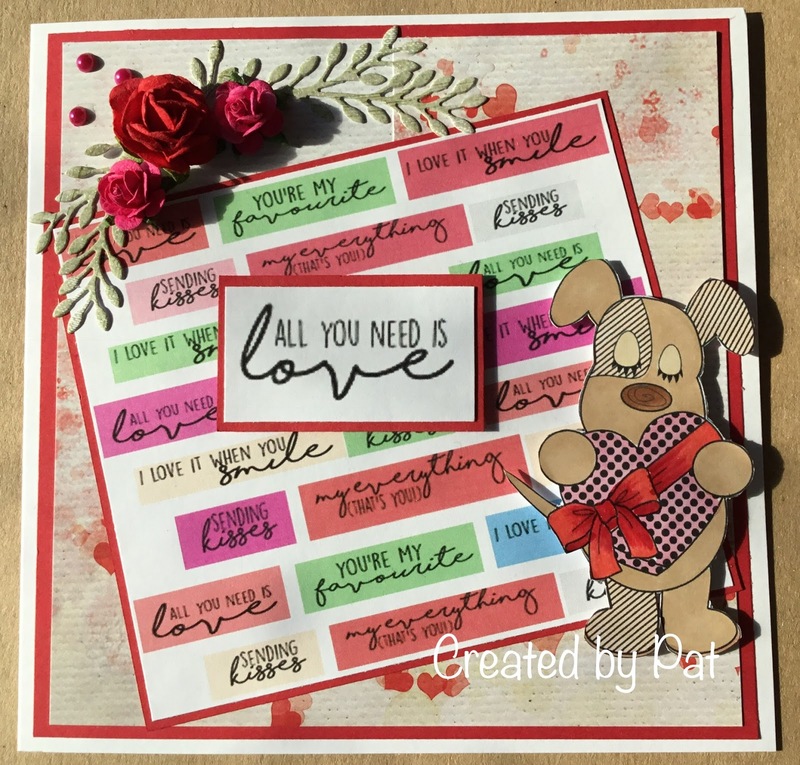 A super card Pat, such a cute dog and fabulous design - you've certainly used lots of words. Lovely card, like the layout. We just got light dusting of snow, least disappear quickly. What a great design Pat, makes for a super Valentines creation. You really said it with words! Great card! Fantastic card, Pat. Henry is so cute and you have words galore on there...!! We've had quite a lot of snow this week and it's bitterly cold - minus 5 when George opened the shutters this morning - hope it's warmer with you. Pat, this is such a fun card - I love the cute image and the script paper with all the 'love' sentiments!